When is it Safe to Fly After Diving? We are asked this question often. When is it safe to fly? If I book a liveaboard that ends on Friday, can I fly on Saturday? If I make a dive on Monday morning can I fly Monday evening? Now, please remember that the question is covered in any beginners Open Water diving course. Only thing is, that the recommendations do change, and there are different numbers thrown about – 12 hours? 24 hours? 8 hours? And if you have forgotten this, it might be a good idea to do a refresher course! Here’s the current flying after diving recommendations from PADI and DAN. The “single dives” recommendation does not affect us here really. All dive trips that we offer (day trips) include 2 or 3 dives, and liveaboards are all multiple day trips with 2 – 4 dives per day. So the figure you want to remember is 18 Hours. 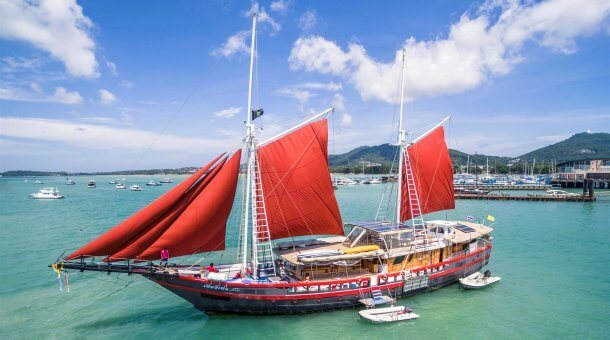 If are booking a typical 4 day liveaboard to the Similan Islands for example, the final dive of the final day is normally before lunch, after which the boat is cruising back to the mainland. So you are safe to fly by next morning. Some people prefer to wait 24 hours, it’s up to you – if your schedule allows, why not have a full relaxing day off before flying out? Be sure to check the itinerary of any trip you book so you know when the last dive will be, and you can plan flights accordingly. Note: Following these recommendations reduces DCS risk but does not 100% guarantee that a diver will avoid DCS. There are of course other factors involved. A major factor in a hot country like Thailand is dehydration – make sure you stay well hydrated when you are on a dive trip. Read more here: Health and Fitness for Diving. What about Diving after Flying? There is no problem with diving after flying. There is no increased risk of DCS if you arrive on a flight and head straight to the ocean – DCS is caused by high concentration of Nitrogen in the blood after diving which can become supersaturated and form bubbles at lower pressures. Before you dive, you have a normal amount of Nitrogen in the blood. However, if you’ve taken a long haul flight, you may be dehydrated which is a factor is DCS. Make sure you drink plenty of non alcoholic fluids on a long flight to prevent dehydration. There is also a tendency for people to arrive in a hot country and head straight to the bar for a cold one. Please remember that alcohol contributes to dehydration, so take it easy on the beers! We recommend that all divers have their own travel and medical insurance, as well as cancellation insurance. 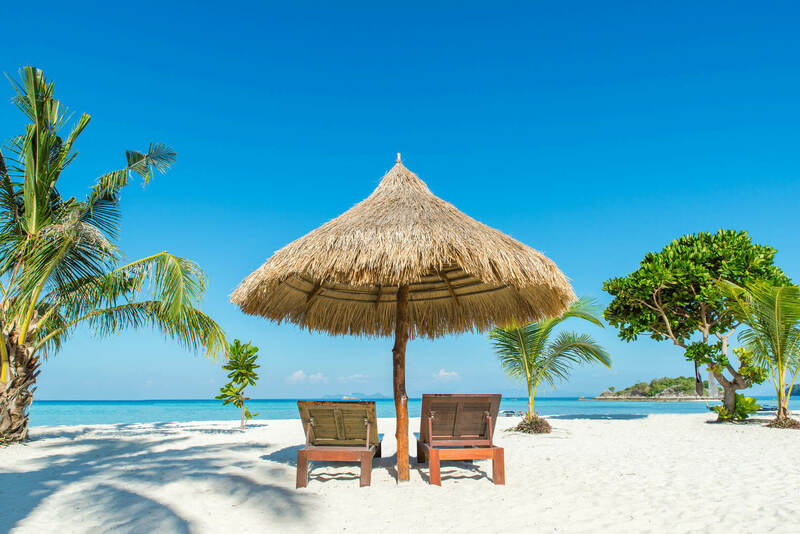 Be sure that your travel insurance policy covers scuba diving! However, prevention is better than cure, so dive safely, follow the rules, use tables and computers and stay healthy! For dive insurance look at DAN or Dive Assure. Or you can pay 250 Baht per diving day when making a booking. Sunrise Divers is based at Karon Beach, Phuket. We’ve been here since 1999. From Phuket and nearby Khao Lak there are liveaboards or day trips with dive sites and boats to suit all divers and all budgets. 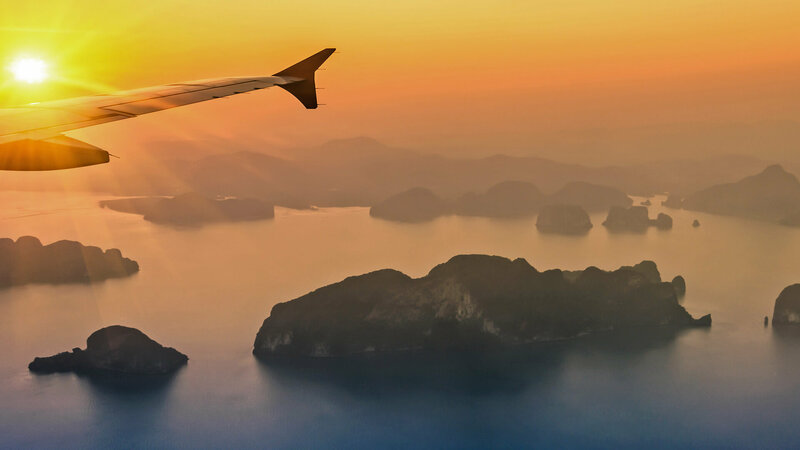 Most liveaboards depart in the afternoons, so you can fly in to Phuket the same day (remember : there’s no diving after flying rule! 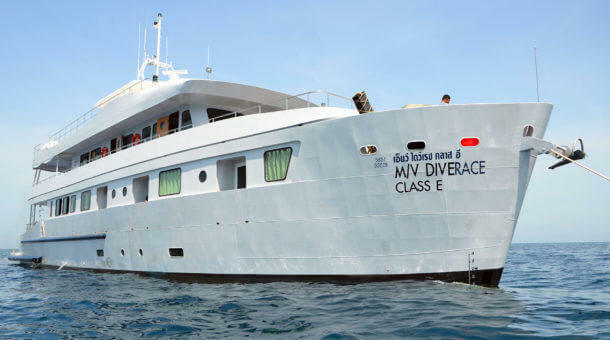 ), and diving starts next morning after an overnight cruise to the Similan islands. When planning a liveaboard be sure you know when the last dives are scheduled so you can plan return flights. After a typical 4 night / 14 dive liveaboard we’d suggest a 24 hour break before flying to be sure you have cleared all that nitrogen out of your body. 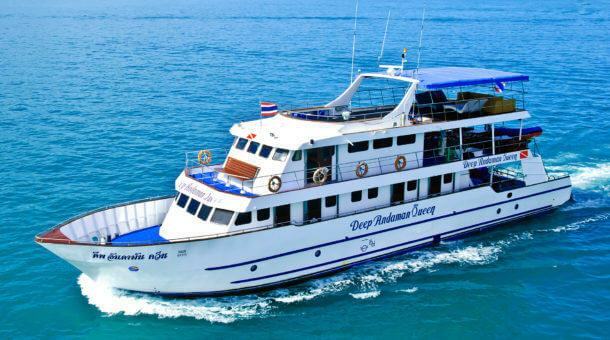 For more liveaboard information start here : Thailand Liveaboards, or contact Sunrise Divers. 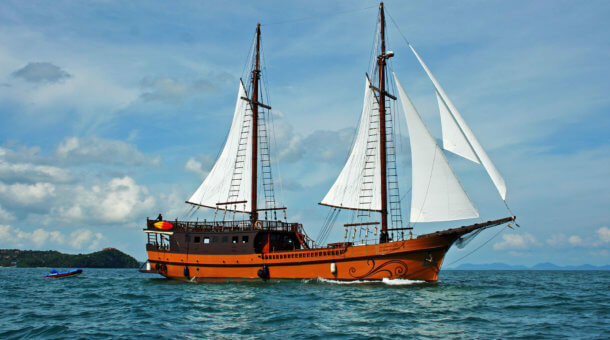 We also offer liveaboard trips in Indonesia.